Targeted Technology Institute with its elite team of expert instructors have established the best hands-on instructor-led training experience. We provide customized job-oriented trainings in highly sought fields of IT. Our training programs are carefully crafted within a well-equipped training center to provide trainees with the needed theoretical knowledge and hands-on experience. 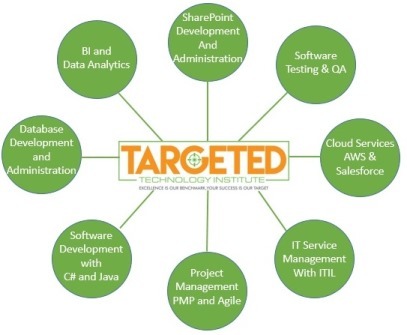 The main goal of Targeted Technology Institute (TTI) is to help trainees to take advantage of their experiences and educational background in various fields and be able to start their professional career along Information Technology path. This is not just a shortcut to a good paying job; rather, it is a boulevard along which you will make use of the experiences and skills you acquired in various fields and add new skills in IT from our well designed fields of study.